We highly recommend upgrading to the Celebrity Kit for wedding gowns which retail at $500 or higher due to the extra included insurance for shipping and extra care in processing. Now Featuring a 100 Year Warranty! The Wedding Gown Preservation Company puts the highest degree of professional care into the heirloom processing of your gown. First your gown is carefully examined to find all spots. A detailed Quality Control Report is updated through each and every step. Proven formulas are used to remove spots and treat the entire gown for sugar stains. Your gown is thoroughly cleaned with extra attention given to the neckline, trim and hemlines. Our experts shape the gown, position a full bust form and fill the sleeves. It is then wrapped in unbleached muslin, and fitted carefully into a premium preservation chest with an acid-free display window. The preservation chest is then enclosed in a 700 pound test shipping carton. Your gown is then shipped back to you pre-paid anywhere in the Continental United States via Fed Ex Ground. The preservation process will be completed in 2 to 6 weeks after it is received. Please note: During the height of our busy season the preservation process may take slightly longer. Repairs or additional services requested may also extend the processing time. Celebrity Line recommended for designer/high-end wedding dress + bridal gowns valued at more than $500. We had an amazing time at my wedding which was capped by my brother-in-law tossing me into the pool at the end of the night. The next day I thought my dress was ruined for sure. I read about other people who had their dresses saved by the team at Wedding Gown Preservation Company so I bought the kit and gave it a try. When I got my wedding gown back I was amazed at what they were able to do with my dress. It looked like it did the day I picked it up at the boutique. Thanks Wedding Gown Preservation Company! I wanted to let you know I received my dress from fed ex yesterday and it looks beautiful. I will recommend you to any bride I know. Thank you so much for taking such good care of it! Thanks for offering the Deluxe Shipping Container; it helped my gown survive a cross-country move. My daughter's Dress arrived today and I opened the outer box to see the dress through the window. The principal and secretaries and I were admiring the dress with "Ohhs" and "Ahhs". I noticed the paperwork attached to the box and saw this ziploc bag with something inside. I opened the bag and to my amazement was the two pieces of notebook paper that my daughter (Kathleen) and her groom (Kevin) had hand written their vows on and were read on their wedding day. It even showed the drops of tears from their eyes. It brought tears to my eyes knowing that the person who was taking care of cleaning my daughter's wedding gown found this somewhere within her dress and knew the importance of these two pieces of paper to the bride and groom. I am so grateful that the vows were not just thrown away. That person made sure the vows were placed in a plastic bag and stayed with her gown and made it safely all the way back to us in Colorado. I am so impressed with your company. I cannot that you enough for your hardwork and dedicated employees! The vow will now be saved in a safe place forever! I received my dress, and I wanted to let you know how very satisfied I was when I saw it! It looks just as beautiful as it did when I bought it for my wedding. Thank you for preserving such a special treasure that I will be able to keep in the family for years to come! Thank you! I received my dress & ring bearer pillow today. Wow! What a fantastic job! I can't believe I waited 5 years to preserve my wedding gown. I am so pleased! You can see the dress so well...and it is not in a closet anymore. What a wonderful service you do. I will pass your name along to anyone I know needing to preserve a gown. Thanks again! I had a beautiful fairytale wedding! The only thing less than perfect at the end of the night was my gown. I ended up with cake icing, grass stains and tar on my gown. Thank you Wedding Gown Preservation Co. for doing such a GREAT job in getting my gown lean and looking wonderful in the chest! My Grandma had her dress cleaned and preserved through you over 50 years ago, as did my mother after her wedding. I can't describe the feeling I had walking down the aisle knowing I was wearing their dress. After my wedding, I sent the gown to you and was given the same great service they received so long ago. The dress still looks fantasic. Two kids and 7 years after the wedding of my dreams, my husband and I decided to buy a new home. Up to our eyeballs in boxes and packing tape, I found my wedding gown hanging in the very back of a closet. Smiling to myself I remembered that wonderful day. With all the craziness I never got my gown cleaned let alone preserved. I sent it to the Wedding Gown Preservation Company and it came back looking like it did that day I purchased it! Now I catch my little girl eyeballing it asking when she can ware it. Thank you so much! I just received my dresses back from you. I cannot believe how clean you were able to get the older gown! The tarnished beading is now back to normal and the dress looks as white and light as I remembered it to be. I had my reservations for sending you this older gown and paying the money thinking that you might not be able to do much with it. Wow - the results proved me wrong. Many thanks! It only takes a few minutes to order your Wedding Gown Preservation Kit from MyGownPreservation.com! Our operators are standing by to process your order the very same day we receive it. 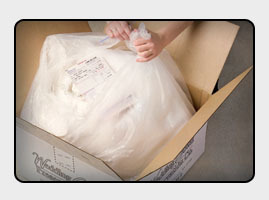 We'll prepare your Wedding Gown Preservation Kit and pack the box with your pre-paid shipping labels. You'll receive your Preservation Kit just days after submitting your order! When you receive your Wedding Gown Preservation Kit, open the box and you'll find everything you need for the return trip. Fill out our simple shipping labels which allow you to choose from either UPS or FedEx. Place your wedding gown in our wedding preservation bag and place the bag back into the shipping box. Either call your shipping carrier to have them pick up the box or drop the box into a conveniently located UPS or FexEx drop box. When your gown is received at the Wedding Gown Preservation factory, your dress quickly begins its journey back in time to the day you purchased it. Your Wedding Gown is hemmed, beaded (if needed), cleaned with a special formula, and dry cleaned by a team of gown preservation experts. Stains are removed such as grass stains, bodily fluid, sugar, pen and virtually any other blemish left over from your big day. After cleaning, a bust form is placed in your gown and the display is neatly assembled in our own museum quality display box. A preservation window allows others to view your dress without touching the dress with their hands and rubbing oils from their hands on the material. Your finished display box is then packed in the heaviest shipping container available on the market and begins the trip back to your home. Step 4 - Preserve your Wedding Gown! Within weeks you'll receive your Wedding Gown after being professionally cleaned and preserved in your own museum quality wedding gown preservation box. Be sure to store your wedding dress preservation box in a dry location in your home. Show your dress off to relatives and friends and cherish your memory for generations!